Capella State High School students will have their heads in the clouds today as they compete to design the most aerodynamic paper planes. 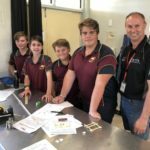 The year-7 students will be mentored by staff from Glencore Coal who will help them use physics to create the longest flying plane. 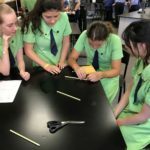 “Physics in Flight was created after a cohort of principals asked the Queensland Minerals and Energy Academy (QMEA) to develop a program to inspire and motive junior students to engage with science in a fun hands-on way,” said Katrina-Lee Jones, Director Skills Education and Diversity with the Queensland Resources Council (QRC). “Glencore is a long-time supporter of QMEA and our staff love to see the students happily engaged in learning while having so much fun,” said Glencore’s Community Relations Manager Craig Strudwick. “It’s so important for them also to see the huge range of careers that can result from science, technology, engineering and maths (STEM) studies and help them select the right topics for these career paths,” he said. Kylie Burns of Capella State High School said the QMEA activities gave students valuable insights into how STEM is all around them. “It’s great to see those ah-ha moments when they link the theory with the practical applications of their lessons,” she said.